This could help us combat superbugs. Every day, the DNA in our cells gets damaged. This might sound scary, but it’s actually a normal occurrence – which makes DNA’s ability to repair itself vital to our survival. Now, scientists are beginning to better understand exactly how these repairs happen. A new sequencing technique that maps out and analyzes DNA damage demonstrates how bacterial cells function in two critical excision repair proteins: Mfd and UvrD. 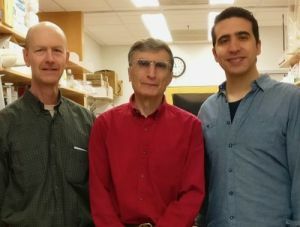 The process, called nucleotide excision repair, has been used by a team from the UNC School of Medicine to gain a deeper insight into the key molecular functions of these repair systems, including the proteins’ roles in living cells. This repair process is known for fixing a common form of DNA damage called the “bulky adduct,” where a toxin or ultraviolet (UV) radiation chemically modifies the DNA. The technique, called XR-seq lets the scientists isolate and sequence sections of DNA with the bulky adduct, thus allowing them to identify its actual locations in the genome. It has previously been used to generate a UV repair map of the human genome, as well as a map for the anticancer cisplatin drug. When the DNA of a bacterial gene is being transcribed into RNA, and the molecular machinery of transcription gets stuck at a bulky adduct, Mfd appears on the scene, recruits other repair proteins that snip away the damaged section of DNA, and “un-sticks” the transcription machinery so that it can resume its work. This Mfd-guided process is called transcription-coupled repair, and it accounts for a much higher rate of excision repair on strands of DNA that are being actively transcribed. In further experiments, the researchers defined the role of an accessory excision repair protein in E. coli – UvrD, which helps clear away each excised segment of damaged DNA. Essentially, think of Mfd as the DNA “un-sticker” and UvrD as the “unwinder.” Using the XR-seq method, scientists discovered evidence of transcription-coupled repair in normal cells, but not in cells without Mfd—implying that the protein played a key role in its repair process. The team’s research and discovery not only heralds the use of this new mapping technique, it could also pave the way for a solution that will help address the pressing, global threat of antibiotic resistance. To support their current research, the team now plans to study XR-seq in bacterial, human and mammalian cells, to better understand the excision repair process.